BANGI, 5 Nov, 2012 – Devastating storms like Hurricane Sandy which ravaged the north-eastern states of America last week has confirmed research findings indicating the possibility of even more dangerous and stronger storms in the future, including in the equatorial regions. Renowned meteorologists, Professor Lord Julian Hunt and Professor Johnny C L Chan said Hurricane Sandy which was dubbed the ‘perfect storm’ and ‘the storm of the century”, could be evidence of more destructive weather phenomena on the way. Prof Chan has developed a computer forecasting model that forewarned airlines in America and Europe of the ferocity of impending hurricanes. In interviews with the UKM News Portal, Britain’s Prof Hunt and Prof Chan of Hong Kong explained that as has already been seen in Asia, the tracks of such big storms may be changing as wind patterns are affected by Climate Change. Both scientists were speaking on the sidelines of the first Workshop on Natural Disasters and Climate Change in Asia, organised by the National University of Malaysia’s (UKM) Southeast Asia Disaster Prevention Research Institute (SEADPRI-UKM). It is also anticipated that cyclones and hurricanes will become stronger in areas where ocean surface temperatures are increasing, such as parts of the Gulf of Mexico from where many storms originate that subsequently batter North America. 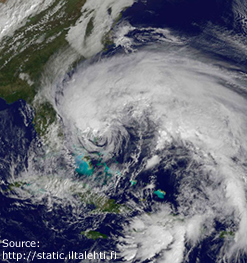 Sandy, a super-storm of unusual ferocity and scale, has already wreaked havoc on much of the east coast of the United States and Canada. It was estimated that some 60 people had been killed due to the hurricane adding to the 70 deaths in the Caribbean where it made landfall earlier. As expected there has been major disruptions in the daily lives of those affected by it including internal transport as well as transport to and from the United States. Around 20,000 flights have been cancelled and more than eight million people have been left without power for days. Overall damage and cost of cleanup is estimated, by some, at US$30 to US$40 billion with New York declared a major disaster area by President Obama, the worst crisis faced by the Big Apple since the attack on the twin towers 11 years ago. Alarmingly, in New Jersey, the Oyster Creek nuclear plant was put on alert after rising flood waters threatened the cooling of its spent uranium fuel rods, reminding people of the Fukushima disaster in Japan. Prof Hunt noted that while Sandy was an unusual storm, the good news is that the intensity was confirmed by computer-forecasting models first developed by Prof Chan almost 20 years ago. It is remarkable that airlines, in particular, have relied so much on these forecasts to make their cancellation plans. This is quite a different experience from the previous ‘storm of the century’ in March 1993 in the Americas when airlines did not make good use of the then computer forecasts. Prof Chan, who teaches at City University of Hong Kong, now chairs the World Met Organisation committee on tropical cyclones. He said even if the number of storms remain the same, there is actually a real rise in sea-levels. He explained that the same storm surges will cause more floods. That apart there is already a higher frequency of heavy rains, so flash floods become more common, as seen in Peninsular Malaysia and South China. 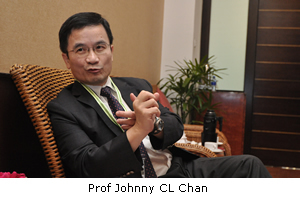 Prof Chan was working with the UK Met Office when Prof Hunt was Director-General there. Prof Chan’s breakthrough allowed for a very wide area of interaction between cyclone winds and the general circulation over 500 miles away from the storm centre, better than the model used earlier. Professor Chan obtained his bachelor and masters degrees in physics from the University of Hong Kong and his PhD in atmospheric science from Colorado State University in the US. After two years as a US National Research Council Post-doctoral Research Associate at the US Naval Postgraduate School, he stayed there as an Adjunct Research Professor for one year. He then returned to Hong Kong and joined the then Royal Observatory Hong Kong as a Scientific Officer. In 1989, he began his academic career as a Senior Lecturer at the then City Polytechnic of Hong Kong (now the City University of Hong Kong) where he is now Chair Professor of Atmospheric Science and Dean of the School of Energy and Environment, as well as the Director of the Guy Carpenter Asia-Pacific Climate Impact Centre. 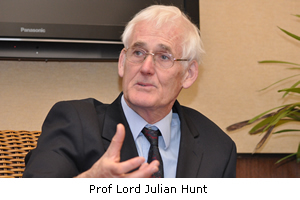 Prof Lord Julian Charles Roland Hunt is a Fellow at the department of Mechanical Science at Trinity College, Cambridge University. He is also Professor of Climate Modeling at the Department of Space & Climate Physics and Department of Earth Sciences at University College London. He was made a Life Peer as Baron Hunt of Chesterton in Cambridgeshire by the Labour government in 2000 and sits in the House of Lords.